Image Caption: Jean-Claude Juncker, President of the European Commission, and Donald Tusk, President of the European Council shake hands. The two men at the head of European leadership have espoused two different visions for the future of the European Union. As the sociologist Karl Mannheim defended in 1929, in a bit of an overstretched simplification, every single one of us has an ideology. By stating that, he opened the door to continued uncertainty and relativism. Is there any true truth? Can knowledge be completely objective? Mannheim also said that utopias developed within the dominant ideology and that these pose as a resistance or alternative movements willing to achieve a determined goal, such as freedom, feminism and, in the case that will be discussed here, the European Union. It is of importance to highlight the fact that utopias can indeed succeed at becoming the new dominant ideology and be then established as the new “ lens” through which one understands and sees the world. This is what those working for the success of the European Union are looking for . The European Union can be understood both as a means and as an end. As a means, it is considered as the most important instrument developed throughout the years of WWII that enabled peace in Europe to reign and stability to come about once more. Furthermore, it sought the reestablishment of Europe as an important region economically, culturally and politically speaking in a world that was bound to be dominated for many years by two opposing great powers, the U.S. and the USSR. As an end, it can be understood as the ideal model for Europe, in which the best possible scenario would lead to a continuous and even someday a complete integration of the European member states into a Federal Union. It can be argued that considering it as an end inherently implies also considering it a kind of utopia, given the fact that the multidimensional issues at stake when talking about the European integration are extremely complex and this goal has often been deemed impossible. Nevertheless, to consider it as a tool or as a goal does not influence the wish of those who support it to see it strive. The EU can be ultimately considered as a beautiful paradox: it seeks to conform unity among differentiation. But the economic and social crisis of 2008, the advent of Brexit, the impact of the recent Italian elections, the rise of populism and of Euroscepticism, among many other factors, seem to be elements hindering and possibly (if looked in a more pessimistic way) blocking the European utopia to become real. Presented with these vital difficulties, several solutions have been proposed to keep the integration achieved so far and make it survive (and even increase). The two most prominent and perhaps contrasting approaches about the future of Europe will be briefly analyzed here. Jean-Claude Juncker, President of the European Commission since 2014, may be considered as one of the best representatives of the European spirit (an analysis of what this exactly means and if it does exist will be left for another post). Born in Luxembourg and fluent in Luxembourgish, French, German and English, he is one of the few politicians able to speak all the main languages of the Union. The Commission, led by Juncker, believes in further integration, seeking to respond to crises by pressing member-states to accept “European” solutions that involve extra powers for EU institutions. In other words, it looks for greater national relinquishment of national sovereignty that ought to be invested in the EU. By reading this statement, readers might be thinking that these are simply some old bureaucrats who are always seeking more and more power. Frankly, this understanding is partly right. The Union is always looking to further increase its power and role, but the reasoning behind this is twofold: first, the EU genuinely believes (as seen by the Commission) that “more Europe” is going to help solve many issues; and, second, any institution, be it national or international, naturally seeks after its continuous consolidation and its survival. One does not need to go further to see that sometimes this position is indeed accurate. If there had been more coordination and better implementation of inter-European measures, couldn’t the 2015 refugee crisis have been mitigated? If there had been a body which could legally obligate the countries to stick to their quotas, wouldn’t negative reactions in countries such as Germany and Sweden have been avoided? This is just one example in which “more Europe” was the right path. “Obsessed with the idea of instant and total integration, we failed to notice that ordinary people, the citizens of Europe, do not share our Euro-enthusiasm,” he said. “You see governments and parties all over, jumping up and down asking for ‘more Europe, more Europe.’ If you want people to massively reject Europe, just keep on.” European leaders are becoming more aware of the weakening bonds and sentiments of the people towards the European machinery, but this awareness needs to be paired with an active, credible and unified effort to improve things. In short, Europe (mainly after Brexit) has been presented with two opposite lines of acting. On one hand, a continued and even increased European integration has been “lobbied” for, mainly from the European Commission lead by Juncker. This can be labeled as “Juncker’s federalism.” On the other hand, a for-the-moment halt in unification to first deal with issues at the national level, relaying in a temporal strengthening of national sovereignty, and of the European institutions themselves. In other words, there must be a change of strategy so that in the future there is actually something to work with or unify. This can be known as “Tusk’s pragmatism”. For those who keep up with the EU and its politics, it is no secret that Tusk and Juncker have quarreled over which should be the manner to respond to EU’s accumulating crises. Tusk and Juncker’s fundamentally different visions on the path the EU and the European population ought to follow shows once more the intrinsic divisions and the hardships associated with the idea that the EU conforms a socially, culturally, economically and politically united and uniform continent. The Spitzenkandidat system for choosing the European Commission president has been a core difference between both. While Juncker himself was appointed by it in the 2014 elections and lobbies for it to be used again in 2019, Tusk aims at “keeping all the options open”, since the idea that the new process is more democratic is often extremely debated. Other issues such as Russia, Greece and migration have been central in the leaders’ ‘spats’ and have deeply affected the course of EU decision making, fostering hardships for problems to be swiftly solved and contributing to further divisions. The already existent European problems are aggravated by trying to choose one solution over the other and by perceiving this situation as a “Juncker vs Tusk” arena. However, a synthesis of both proposals would be the most optimal approach to the European future. Why? Because Tusk’s pragmatism indirectly advocates for the momentary enhancement of national sovereignty, and this is a scenario that could also result in something dangerous. Given the fact that solving national problems can take many years, such a one-sided approach as Tusk’s would ultimately stalling the European integration process. There is a real risk that if national governments get a taste of a somewhat extended freedom (compared to what they now have), and that they would clamor for independence. Therefore, as Agata Gostynska-Jakubowska so perfectly put: “the Commission’s passion for the EU’s fundamental principles and Tusk’s understanding of different concerns across member states could make a potent combination if they act together. They could also make an explosive cocktail if they don’t.” The two Presidents ought to work together towards finding a rightly fit European solution, one that is able to preserve and respect the European political and national diversity while maintaining the vows to keep the European pillars standing. The need for greater democratic legitimacy of national policies in comparison to those imposed by technocrats in Brussels or Frankfurt presents itself as a fundamental current change. The EU does need to give Europe’s national governments more freedom to act, but it also needs to ensure that the European goal is always kept in mind and alive. The moment for partial blindness has got to come to an end: the structural problems of the institution should be resolved, and national governments ought to clean the “mess” back home. Many say that the EU will survive its current crisis. I firmly believe and hope so. With Brexit and the rise of populism and Euroscepticism, this has come to what can be considered as one of the most critical moments of the EU’s existence. But if it learns from it well enough, it will not only come back stronger and more stable, but possibly also more integrated. Stephanny Ferreira is a Brazilian fourth year undergraduate student of International Studies at the Autonomous University of Madrid, currently on a semester exchange at the National University of Singapore. The international political and historical spheres, with a recent emphasis on identity and nationality engineering, have always been her main interest, especially given her personal experience of living abroad since high school in Germany, Spain, and Japan. MANNHEIM, K.; Ideologie und Utopie, 1929. “Juncker wird Spitzenkandidat der Konservativen”, RP Online, 7 March 2014, consulted on 23 March 2018, http://www.rp-online.de/politik/eu/juncker-wird-spitzenkandidat-der-konservativen-aid-1.4090102 . GRANT, C.; “The impact of Brexit on the EU”, Centre for European Reform, 24 June 2016, consulted on the 23 March 2018, https://www.cer.eu/insights/impact-brexit-eu . VALVUR, A.; “Merkel, Tusk focus on EU economic woes at award ceremony”, Deutsche Welle, 13 May 2010, consulted on the 23 March 2018, http://www.dw.com/en/merkel-tusk-focus-on-eu-economic-woes-at-award-ceremony/a-5570323 . GRANT, C.; “The impact of Brexit on the EU”, Centre for European Reform. 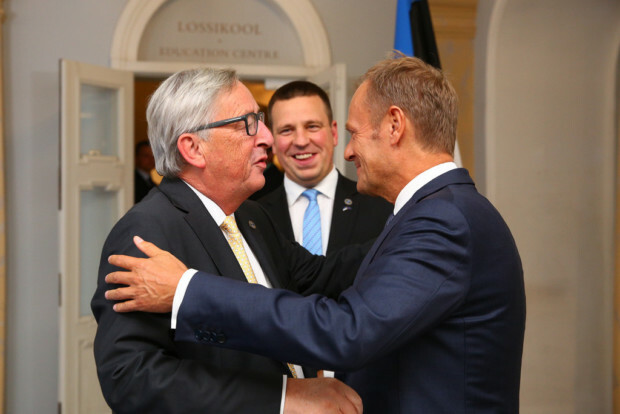 GOSTYNSKA-JAKUBOWSKA, A.; “Juncker-Tusk: A clash of EU visions”, EUobserver, 16 September 2016, consulted on the 23 March 2018, https://euobserver.com/opinion/135122 . HEATH, R.; “6 spats between Tusk and Juncker”, POLITICO, 22 March 2018, consulted on the 15 August 2018, https://www.politico.eu/article/fight-club-six-spats-between-donald-tusk-and-jean-claude-juncker/ . BORG, A.; “Federalism is the greatest threat to the future of Europe”, World Economic Forum, 06 July 2016, consulted on the 16 August 2018, https://www.weforum.org/agenda/2016/07/federalism-is-the-greatest-threat-to-the-future-of-europe/. GOSTYNSKA-JAKUBOWSKA, A.; “Juncker-Tusk: A clash of EU visions”, EUobserver. VALVUR, A.; “Merkel, Tusk focus on EU economic woes at award ceremony”, Deutsche Welle, 13 May 2010, consulted on the 23 March 2018, http://www.dw.